AAEM Resident and Student Association : Clinical Exam for Shoulder Injuries: Which are worth the time? Clinical Exam for Shoulder Injuries: Which are worth the time? The take-home message is that some of these tests offer very strong +LR and can almost diagnose the disorder (e.g. biceps load test sporting a +LR of 26). Taking a combination of findings can be helpful as well, as demonstrated by the Hegedus review that combined tests. An MRI may still be indicated, as well as certainly follow up with the patient’s primary care doctor or an orthopedic surgeon, but these tests can go a long way to help clarify the picture. 1. Somerville L, Bryant D, Willits K, Johnson A. Protocol for determining the diagnostic validity of physical examination maneuvers for shoulder pathology. BMC musculoskeletal disorders. 2013;14:60. PubMed PMID: 23394210. Pubmed Central PMCID: 3579687. 2. McGee S. Simplifying likelihood ratios. J Gen Intern Med. 2002 Aug;17(8):646-9. PubMed PMID: 12213147. 3. Luime JJ, Verhagen AP, Miedema HS, Kuiper JI, Burdorf A, Verhaar JA, et al. 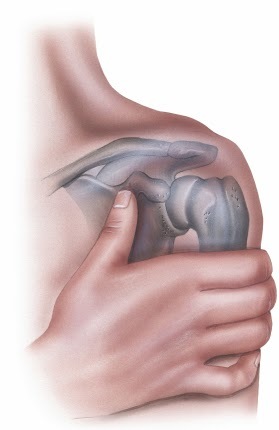 Does this patient have an instability of the shoulder or a labrum lesion? JAMA. 2004 Oct 27;292(16):1989-99. PubMed PMID: 15507585. 4. Hegedus EJ, Goode AP, Cook CE, Michener L, Myer CA, Myer DM, et al. Which physical examination tests provide clinicians with the most value when examining the shoulder? Update of a systematic review with meta-analysis of individual tests. Br J Sports Med. 2012 Nov;46(14):964-78. PubMed PMID: 22773322.